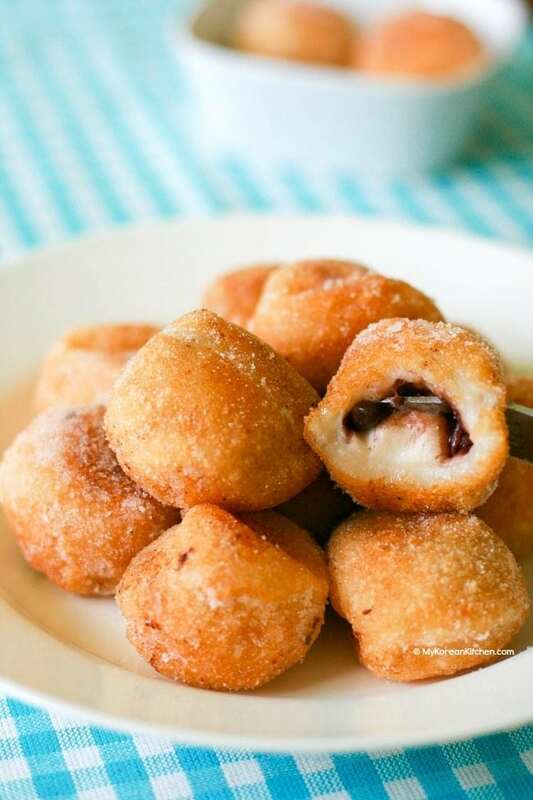 Chapssal donuts are deep fried donuts that is made with sweet rice flour. Its outside is crunchy but inside is soft and chewy like mochi rice cakes. 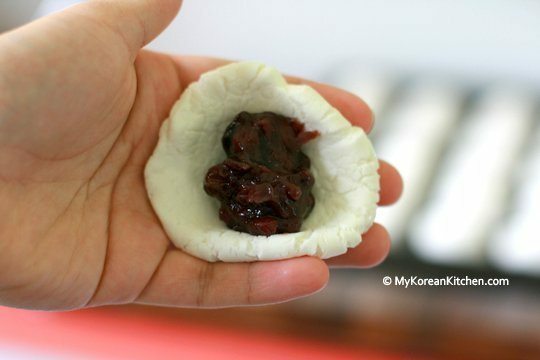 It’s an addictive Korean snacks filled with sweetened red bean paste. A new habit of mine since I came back to food blogging is “food ingredients hoarding”. I look around the internet for blogging inspiration or weekly menu planning and when I see some nice photos of food I write down the ingredients immediately onto my weekly grocery shopping list. I always “intend to” make it straight away, of course. But quite often, I get so distracted by overflowing other delicious looking food and my uncontrollable food cravings that my tiny little pantry has been overcrowded by my hoarded food ingredients for some time. So this tin of sweetened red bean paste has been squatting in my pantry for about two months now and I thought I ought to send it out finally! I’m not promoting this product nor this brand. It was the only red bean paste I could find. 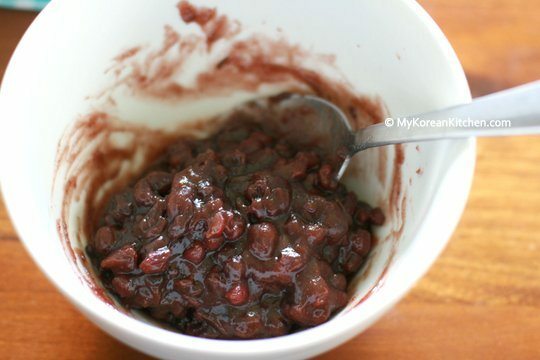 I was going to use this red bean paste for my Chapssal Donuts (찹쌀도넛, Korean Glutinous Rice Ball Doughnuts). It used be one of my favorite childhood snack foods sold at street markets in Korea. While my sister and my husband really enjoyed this snack, I wish it was browner and sweeter! I just got so scared of burning my pan, so I must have under cooked it for the darker brown colour. I also didn’t add additional sugar on the red bean paste (as it was already sweetened) but I think I want it to be sweeter. Maybe it’s my late afternoon sugar rush speaking. lol. Nonetheless, it’s a very good snack food if you have kids. Enjoy cooking and share with your fellow foodies how you went! 2. Sieve the sweet rice flour and self-raising flour into a large bowl. Add the salt, melted butter and hot water. 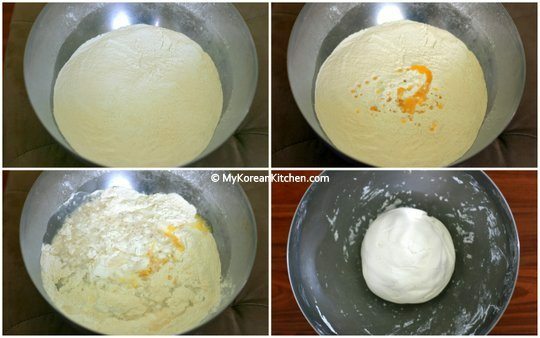 Mix all the ingredients well and knead it to make one large dough. 3. 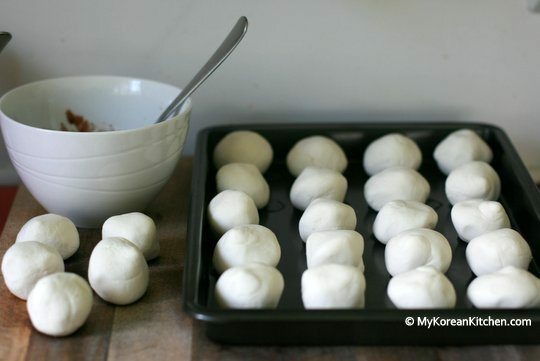 Take the dough out onto a cutting board and divide it into smaller pieces to make mini round balls. (The size can be up to you but remember that larger doughnuts take longer to cook. Also make sure it is large enough to hold the stuffing inside.) While working through, cover the mini balls with glad wrap to stop them drying out. 4. Open up the dough by pressing the rolled balls with your thumbs. Add the stuffing mixture and close the dough. I added ¼ tsp worth stuffing on each ball. You could add more or less, just make sure you can close the dough without getting messy – (note that the photo below has much more stuffing than necessary, so that you can see what it looks like). Repeat this until you use up the prepared ingredients. 5. Deep fry the donut in a deep sauce pan (on medium high heat) until the dough is golden brown. You will have to continuously roll the donut while cooking so it doesn’t stick to the base of the pan, and to shape it better. Place the cooked doughnuts onto a piece of oil absorbing paper and cool down for 10 to 15 mins. Repeat this with the remaining ingredients. Be sure to watch out for oil splash. 6. Sprinkle the sugar onto the donuts or roll them on a plate of sugar. Alternatively, put the sugar into a plastic bag and added the donuts. Then while holding the top of the bag, shake the bag. It is best to consume all the doughnut holes within the first few hours of making them. (Tastes best within the first 30 mins.) Otherwise, outer layer of the doughnut holes get soft (not crunchy any more) and the inner layer gets hard. Also the sugar starts melting and runs on the doughnut holes, making them sticky. If leftovers are unavoidable, you can put them into an air tight container and leave them at room temperature overnight. 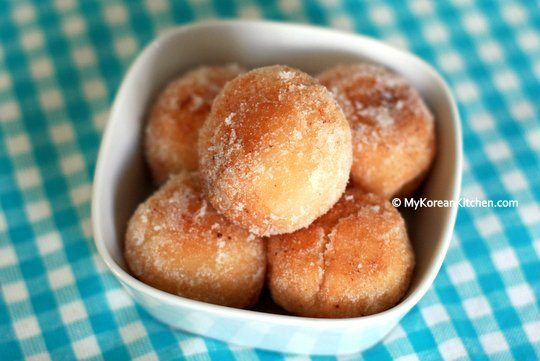 Doughnut holes can be microwaved for about 1 min. Just don’t expect the same texture as the first day. They are still edible but not as nice. 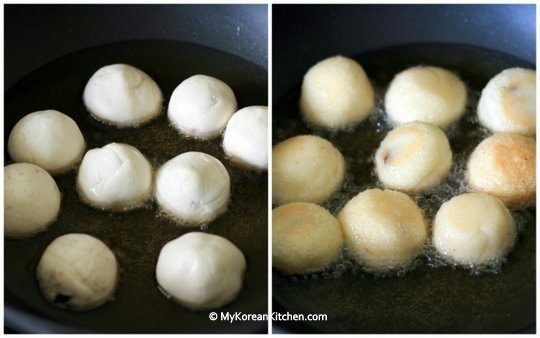 Korean donut holes filled with red bean paste. 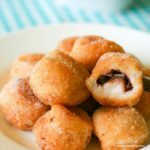 Chapssal donut recipe! Take the dough out onto a cutting board and divide it into smaller pieces to make mini round balls. (The size can be up to you but remember that larger doughnuts take longer to cook. Also make sure it is large enough to hold the stuffing inside.) While working through, cover the mini balls with glad wrap to stop them drying out. Open up the dough by pressing the rolled balls with your thumbs. Add the stuffing mixture and close the dough. I added ¼ tsp worth stuffing on each ball. You could add more or less, just make sure you can close the dough without getting messy - (note that the photo below has much more stuffing than necessary, so that you can see what it looks like). Repeat this until you use up the prepared ingredients. Deep fry the donut in a deep sauce pan (on medium high heat) until the dough is golden brown. You will have to continuously roll the donut while cooking so it doesn't stick to the base of the pan, and to shape it better. Place the cooked doughnuts onto a piece of oil absorbing paper and cool down for 10 to 15 mins. Repeat this with the remaining ingredients. Be sure to watch out for oil splash. Sprinkle the sugar onto the donuts or roll them on a plate of sugar. Alternatively, put the sugar into a plastic bag and added the donuts. Then while holding the top of the bag, shake the bag. I just made some red bean paste to make donuts but I do have a problem converting the grams to oz./cups. I checked the site for the conversion you mentioned but I don’t find it easy to follow and I find it a little annoying having to spend too much time every time I want to convert the measurements. I am sure many other people would really appreciate it if you could provide imperial measurements in brackets so that everyone in the world wherever they live can follow your recipe easily. Most cookbooks these days provide both measurement. I can assure you that you will make many people very happy if you provide both measurements. Could you please consider doing it? BTW I really enjoy looking at your blog. Thanks. Can I make the dough, shaped and leave overnight in fridge and fry the next day? I recently tried making the doughnut holes in two different days as you described. And my answer is Yes/No. Based on my experiment, it only worked on 50% of the doughnut holes. To make it work, they have to be warmed up at room temperature first. Then warm them up further by rolling individual doughnut holes between your palms. This is also an opportunity for re-shaping as some of the doughnut holes get flattened slightly overnight. I really don’t like red bean paste but I love every other kind of chapsal I have tried-with custard, pumpkin and sweet potato, as well as plain. I tried to make this recipe with no stuffing and my chapsal came out very glutinous to the point where they kind of tasted like rice cakes instead of donuts. Any suggestions? Hi Sarah, The texture of Korean style donut is different to western style donut. I assume you already know this since you tried other chapssal donut kinds. They are glutinous/sticky like rice cakes. Perhaps, you could mix in more of other flour (e.g. plain all purpose flour or plain rice flour) to reduce the glutinousness. Hope you get the texture you like. Let me know how you go! I’m a stupid American, I do not know how to convert grams to cups or ounces, could you please supply conversions for this recipe? This recipe looks amazing! I’ve been searching everywhere for a good chapssal recipe, and I can’t wait to try yours! If I don’t have self-rising flour in hand, would you know how much baking soda/powder and all-purpose flour I would need as a substitute? I’ve been looking for a red bean doughnut recipe. This looks amazing, can’t wait to try it! I hope you like it Zoe! These look delicious! 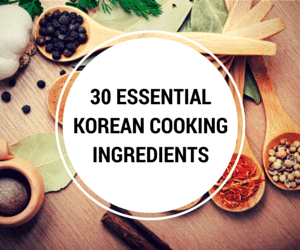 I have never tried to make Korean desserts. I love to bake but haven’t tried with rice flour yet. When I feel brave, I will definitely try these! 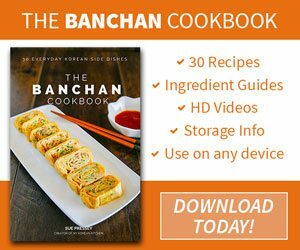 I haven’t made much of Korean desserts either, but I am trying to make more of those. For these donuts you don’t need to bake. You just need to deep fry them. Thanks for stopping by. You just got yourself a new subscriber. 🙂 I really want to try this out. We can get fresh red bean paste here. I think I’ll experiment. 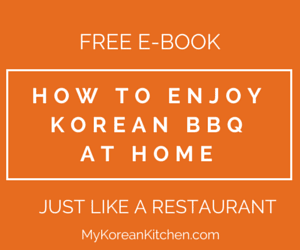 Hi Jayne, Thanks for following My Korean Kitchen! I hope your experiment goes well. Tell us how you go. I would LOVE to hear about it!! You know what? 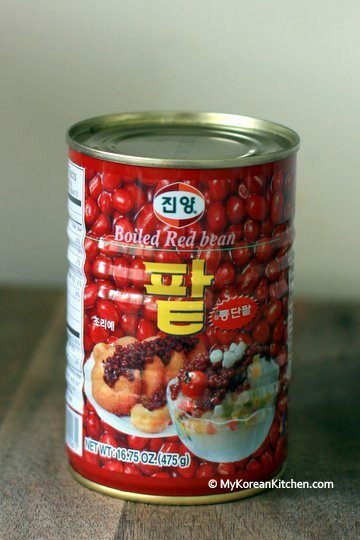 I have a can of red bean in my pantry as well, but mine is almost 2 years old. LOL!!! I think I should get rid of it. Your chopssal donuts look delicious. I can feel the chewy texture by just looking at your pictures. OMG, I can’t believe it Holly! You made me laugh. 😀 Thanks for stopping by. I love this little glutinous balls filled with red beans…yours look delicious. Thanks Juliana for stopping by. You have a lovely weekend too! 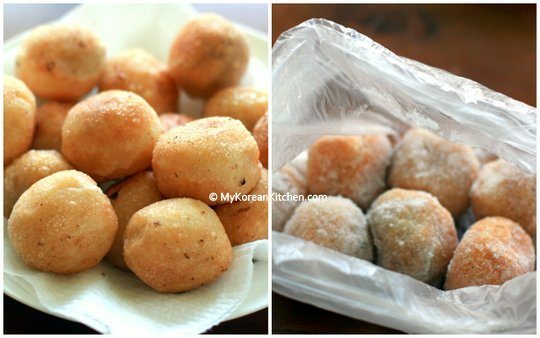 Your rice ball doughnuts look so tempting, I love the first picture especially and I am just can’t stop drooling looking at it. I wish I could get some red bean paste here to give it a go! Thanks Helene for stopping by. I would love hear if you get to try this recipe! Hehe-this time you can make steamed buns…oh even better green tea steamed buns with red bean paste! I wish I have them right now-it’s been a while since I made them! I rarely say this about Asian desserts, but these rice doughnuts look irresistibly soft and yummy. I have never been a fan of European rice desserts, so I was pleasantly surprised I loved the rice balls I tasted in Tokyo last year. They were not cooked like these, but they were slightly chewy, soft and absolutely delicious. Love your idea of adding plum jam instead. 😀 I can already imagine the sweet and sour combination melting away within the lightly chewy donuts. These doughnuts remind me of a story my son tells about going to a family wedding in Taiwan. He’s a picky eater at the best of times and lost about 25 pounds during that trip. Finally he saw these gorgeous doughnuts and couldn’t wait to take a bite. He can eat them now but years ago, beans were not his friend. I’ve had these before, but never made them. They look wonderful! Really nice recipe and post – thanks so much. Thanks John, Did you like the donuts when you had it before? I hope you did. They are a bit addictive! I ate these in Japan, well something similar and they were coated in sesame seeds too. I have always wanted to eat them again as the red bean insides were so addictive. Nice one. Does Japan have these too? I didn’t know that. There are many variations of these donuts in Korea too, including the ones with sesame seeds. I was hoping that filling that I see from the first picture is red bean, and YES IT IS!!!! OHHHHHH! I love red bean as much as chocolate. How can I resist these! Major drool going on.